© 2006-2018 by Zack Smith. All rights reserved. A crêpe is essentially a French pancake. The batter is somewhat different than American pancakes of course, because the end result is supposed a flatter. -- when done at home. -- used at a creperie (a restaurant just for crepes). In the USA you can get something larger made by Le Creuset. When I bought a crepe pan at the restaurant supply store Mora in Paris for about 9 €, I also bought a flat wooden spatula for about 2.50 € and a flattening tool for 2 € which I only need when I want a really flat crêpe. 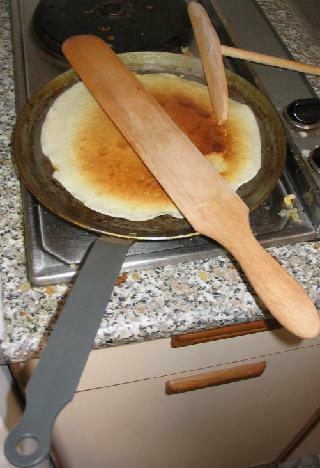 When I made crepes in France I used premade crepe mix that I bought in a French supermarket (LeaderPrice). Note, I did this because it was cheap: 1.15 euros (US $1.45) buys 400 grams (0.88 lbs) of mix. The box showed that it contains wheat flour, powdered eggs, sugar, salt, and leavening powder which is sodium carbonate and diphosphate dioxide, plus an emulsifier E322. In the USA, crepe mix is rare and if you find it, it will probably be expensive. But this is not a problem. Just use the simple basic batter recipe below to make a tasty, low-cholesterol crepe. To prepare either the boxed batter or home-made batter, you typically need to use milk that is at room temperature. To prepare the pan I have found it is best to use an oil with a high smoke point, such as grape seed oil or canola. However I've had problems using olive oil. Put the pan back onto the stove surface and leave it until the surface becomes dry and the edges begin to curl up. At that point use the very thin spatula such as the crepe spatula in the photo to get under the crepe, pull it up and flip it over. If you have a properly seasoned pan, and properly mixed batter, the crepe should come right up and when it is fully cooked it should slide right off the pan. I do not suggest that you use a nonstick pan for this or for any other purpose because nonstick pans puts a Dupont chemical into your foods called C8 that may cause cancer. The result is usable immediately. Fry until the top is dry, then flip. If you can't use room-temperature ingredients then either wait for a half-hour before using the batter or microwave them for a minute. At some health-food stores you can buy spelt flour, which has more flavor than white flour (almost anything does) and has a nutty flavor. The result is usable immediately. Fry until the top is dry, then flip. Serve with a pinch of sugar and blueberries. This is a healthy, experimental crepe batter that I created to add some fiber, which is a good thing to have in the morning, as is the flax oil. The resulting crepes are orange and have a pumpkin-and-spice scent. Add a drizzle of honey and serve.